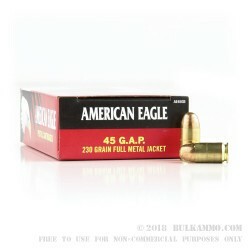 Keep your shooting costs low with Federal American Eagle ammunition in .45 GAP. 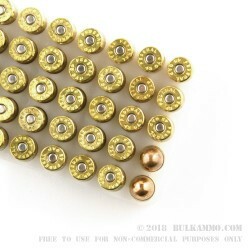 These cartridges will function reliably and accurately in your Glock but cost much less than defensive loads. 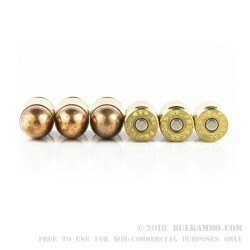 Each round fires a heavy 230 grain full metal jacket bullet at a relatively slow muzzle velocity of 880 feet per second. The .45 GAP (Glock Automatic Pistol) is designed to address some of the shortcomings of .45 ACP in the Glock platform. It is not interchangeable with the .45 ACP! 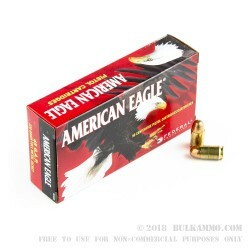 These cartridges are made in the USA and use non-corrosive Boxer primers and brass cases.